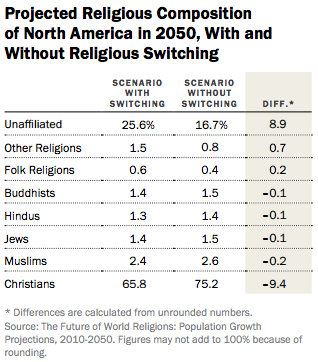 US Christians will decline from more than three-quarters of the population in 2010 to two-thirds in 2050, and Judaism will no longer be the largest non-Christian religion. Muslims will be more numerous in the U.S. than people who identify as Jewish on the basis of religion. NOTE: Decadal data from 2010 to 2050 are available here. Pew Research Center. April 2015. Since 1948, Gallup has polled Americans on their religious affiliation. The question wording has changed a bit over time, but the questions have always asked explicitly about Protestant, Roman Catholic, and Jewish affiliation. Starting in 2000, the poll added Mormon and Muslim affiliation. Values for responses of “Other” “None” and “No Answer” have also been recorded since 1948. Gallup. Accessed July 26, 2016. Tom W. Smith, et al. 1972-2014. General Social Surveys. NORC at the University of Chicago. TO DO: EXTRACT DATA FROM GSS. CLARIFY THE FIGURES ON THE GSS WEBSITE. Michael Hout, Tom W. Smith. March 2015. The Pardee Center (University of Denver) maintains a forecast database called “International Futures.” The “Social” subset includes an index for “Traditional/Secular-Rational” outlook for the US (scroll to the bottom of the list). Annual index values are available for 2010-2030.
International Futures. Accessed July 26, 2016. Note: This indicator refers to the cultural dimensions of “traditional values” and “secular-traditional values” defined by the World Values Survey, here. This chart refers to The General Social Survey question, “How often do you attend religious services?” The variable name is “attend.” GSS data for this question/variable available 1972-2014, but the data on their website is given in absolute numbers. TO DO: EXTRACT DATA FROM GSS. CLARIFY THE FIGURES ON THE GSS WEBSITE. 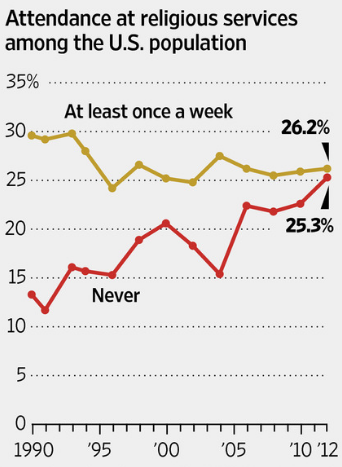 ASK ABOUT CONVERTING TO PERCENTAGE OF US POPULATION, AS THE FIGURES WERE QUOTED BY THE WSJ. Construction of religious buildings in the U.S. has fallen to the lowest level at any time since private records began in 1967. 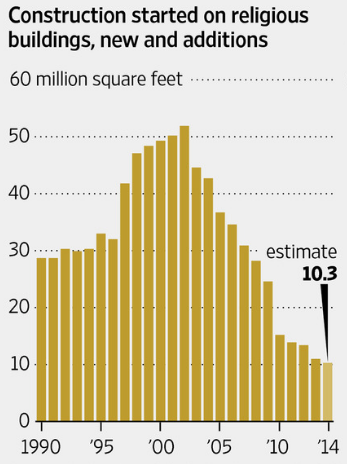 Religious groups will build an estimated 10.3 million square feet this year, down 6% from 2013 and 80% since construction peaked in 2002, according to Dodge Data & Analytics. In terms of dollars, spending on houses of worship totaled $3.15 billion last year, down by half from a decade earlier, according to Commerce Department figures. There are signs the long decline in church-building may have hit bottom. While construction is down this year, the pace of spending has inched up since the end of 2013, the Commerce Department said. Two private firms, FMI and Dodge Data & Analytics, both expect spending to rise modestly in 2015. Behind the decline is a confluence of trends: a drop in formal religious participation, changing donation habits, a shift away from the construction of massive megachurches and, more broadly, a growing taste for alternatives to the traditional house of worship. A decline in church membership and religious service attendance has weighed heavily on religious building construction over the past 13 years. Things didn’t get much better in 2015. Starts slid 5 percent (9.3 msf), though dollars grew 5 percent ($1.8 billion). A 5.6 percent rise in donations ($482 billion) has helped this sector. In 2016, expect a 3 percent gain (9.6 msf) and 5 percent added dollar value ($1.9 billion). Religious Buildings, 1992, 1995, 1999, 2003, 2012. US US Energy Information Administration. Table B2. Summary table: total and medians of floorspace, number of workers, and hours of operation, 2012. Table B2. 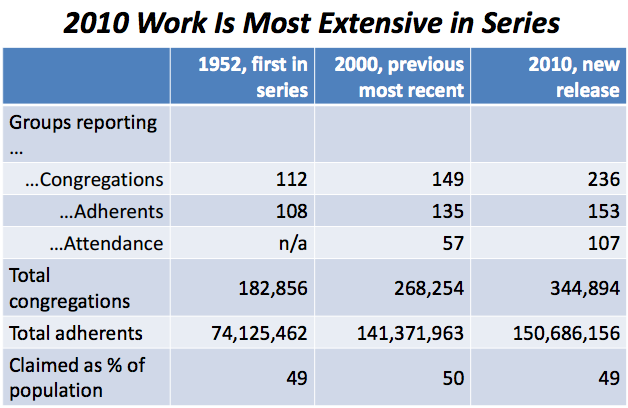 Summary Table: Totals and Medians of Floorspace, Number of Workers, and Hours of Operation for Non-Mall Buildings, 2003. NOTE: Prior to 1992, religious buildings were grouped (unitemized) into a larger category called “Assembly,” which also included entertainment buildings (eg: museums, concert halls), recreational facilities (eg: gyms, indoor pools), and social/public/civic assembly buildings (eg: auditoriums, convention halls). The Association of Statisticians of American Religious Bodies (ASARB) collects data on religious congregations going back to 1952. Congregations: Congregations may be churches, mosques, temples, or other meeting places. A congregation may generally be defined as a group of people who meet regularly (typically weekly or monthly) at a pre-announced time and location. Association of Statisticians of American Religious Bodies (ASARB). May 2012. Congregations from previous ASARB censuses are made available via the Association of Religion Data Archives (ARDA). Totals by individual religious group are available at the ARDA website. 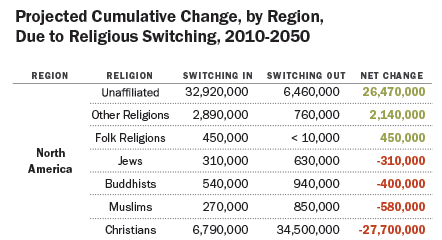 NOTE: Estimates of Muslim, Hindu, and Buddhist congregations only included in 2000 and 2010 census totals. Association of Religion Data Archives (ARDA). Accessed July 27, 2016. The following figure contains North American data. 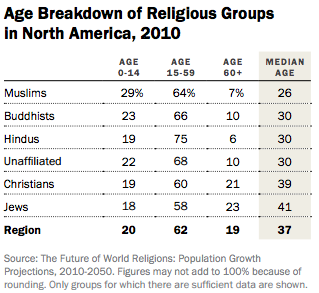 Pew-Templeton Global Religious Futures Project. 2015. 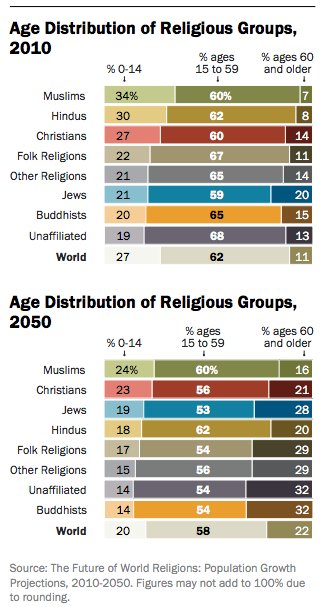 The Pew “Future of World Religions” report referenced above classifies new/emerging religions under their “Other Religions” category. The end of the report (p.124) includes an overview of the religions included in this category, “Spotlight on Other Religions.” Among the handful of faiths that are called out in this section, Wiccans are the only new group called out in the US specifically, and the report explains that reliable estimates of their numbers are not available. Other new groups called out in the report, but not described with any geographic predominance, are Cao Dai, I-Kuan Tao, Mandaeism, the Rastafari movement, the Rātana movement, Scientology and Yazidism. The US Census does not ask questions about religious affiliation, but some of its reports have included data collected by the American Religious Identification Survey (ARIS). ARIS has been conducted in 1990, 2001, and 2008. The ARIS 2008 report includes a “New Religious Movements and Other Religions” category, which includes Scientology, New Age, Eckankar, Spiritualist, Unitarian-Universalist, Deist, Wiccan, Pagan, Druid, Indian Religion, Santeria, Rastafarian. Barry A. Kosmin, Ariela Keysar. March 2009. 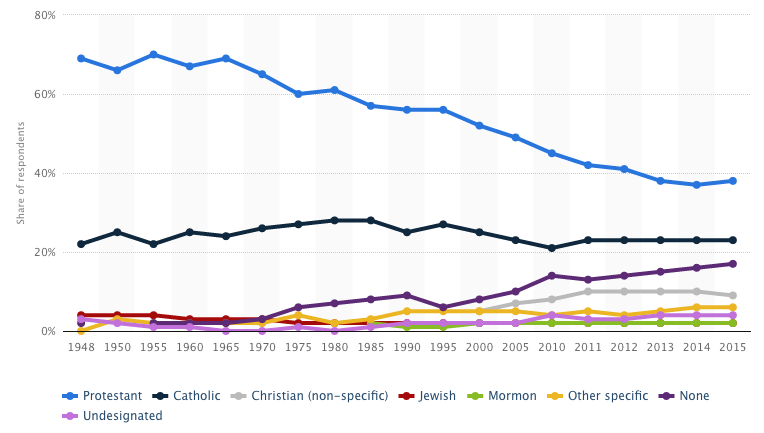 Although their list does not indicate rates of growth, ProCon.org published a list of US religions and denominations which includes the date founded, total members, and members as a percentage of the total adult “religious” population (based on 2001 data). ProCon.org aggregated its list largely from ARIS, referenced above, but also supplemented from a few other reputable sources. The list is sorted by membership size as of 2001. The list includes a total of 313 religions and denominations. 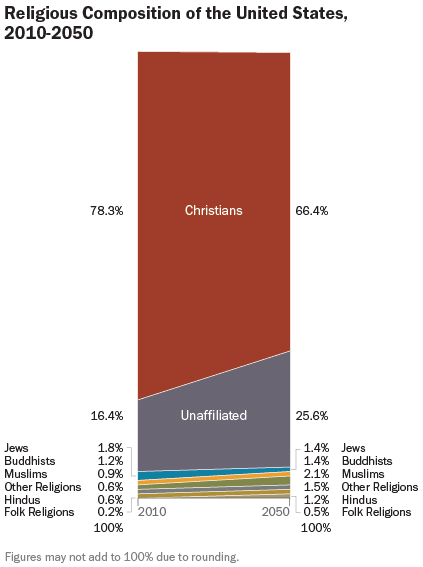 The overall group is broken down into 28 of the largest groups, with expanded sections on 35 Christian denominations, 124 “Other” religions, and 127 “New Age” religions. ProCon.org. Accessed August 1, 2016.